Ousted Golden Dawn MP Konstantinos Barbarouris was arrested in a anti-terror police operation on Monday morning. The fugitive MP was hiding in a friend’s home in Penteli, North Athens. According to media, he was arrested at 8 o’ clock Monday morning. He was reportedly arrested when he was exiting the house. He did not resist the arrest. The “friend” was released, police is seeking for the house owner, who is allegedly a female friend of his. He allegedly told police he returned to Athens from Aitoloakarnia on Sunday, avoiding highways and driving through mountainous land roads. Police had spotted his car, the vehicle granted to him from the Parliament, near the house where is was arrested. Police said on Saturday, the MP escaped arrest late Friday night after a car chase on highways on Western Greece where he drove at a speed of more than 200 km per hour. An arrest warrant was issued on Friday, after the MP said in the Parliament, the army should stage a military coup and arrest Prime Minister, Alexis Tsipras, President of the Republic, Prokopis Pavlospoulos, and Defense Minister, Panos Kammenos. His statements were made during a plenary debate on the no-confidence motion against the government submitted by conservative New Democracy due to the Macedonia agreement. 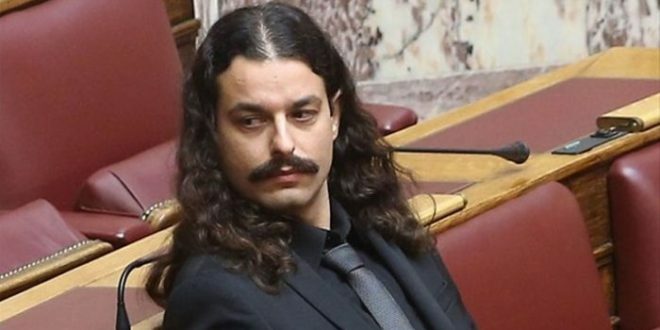 In fast track prosecutes judicial authorities issued an arrest warrant on felony charges that Barbarousis “incited to acts of high treason.” He was expelled by Golden Dawn and has the status of “independent MP.” Parliamentary immunity doe snot protect from felony charges. Skai TV broadcast footage where Barbarousis is shouting “Macedonia is Greek”, while in a police car on the way form Police headquarters to prosecutor.